I would like to nominate Sister Fatima for "Official Nerf Crime Victim in the video game of life." To find out what happened to her, check out Spearhead's Stay Human CD. Medea's Campaign is another story. She did well enough in the general election on November 6th, 2001, to make the runoff. However, the initiative that was on the ballot to create the board she was running for didn't pass. She became the first person I know that could have been elected to a seat that doesn't exist. Audie Bock was the first Green elected to high Partisan Office in California that I can remember. I think there were others before I was born, but I never saw current articles about them in the newspaper. I think she lasted six months as a Green because the "two party system" ganged up on her. I'm sure there is more to it than that, but the details all seemed to boil down to finger pointing in my memory. Six months after she was elected she changed her voter registration from Green to Decline to State. She stayed in office until the next election cycle, when she lost her seat to a Democrat. The coffee cup above is more than twenty four years old. I originally had 144 made. This picture contains an image of one of the two I still have. I used to get confused about what an Indian is. Gandhi was an Indian. People from Indiana are Hoosiers. 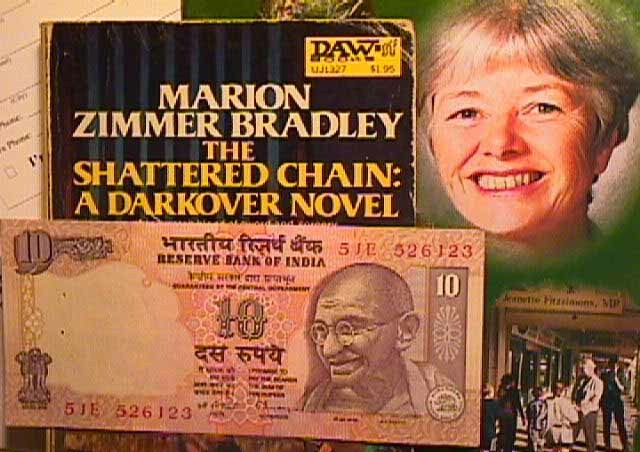 I've read Jeanette Fitzsimons is working with the slogan "Globalize consciousness, localize economies." 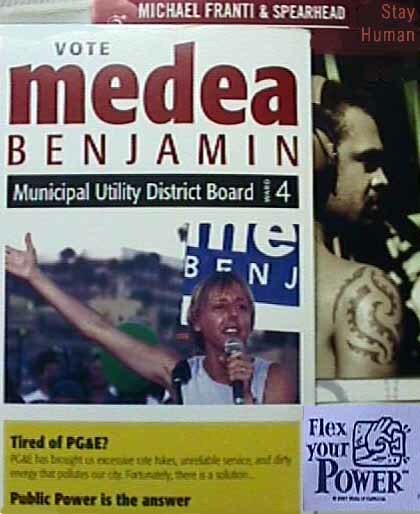 Long before I got involved with the internet I did a couple of grass roots campaigns in Sacramento. 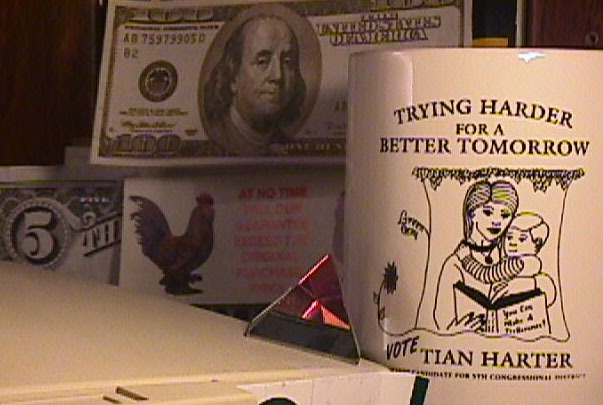 In 1994 I ran for City Council. Click here to see my report on the experience. In 1992 I ran for Congress (5th CD). Click here to see my report on that experience.